As a part of my series about “Big Ideas That Might Change The World In The Next Few Years,” I had the pleasure of interviewing Megan Hayes and Kimberly Reilly. They are the co-founders of Everybody Water, a water brand with the mission to fund access to clean water and sanitation systems around the world while reducing plastic bottles, using a 100 percent recyclable carton alternative. Based outside of Boston, Massachusetts, Megan and Kimberly have successful track records as entrepreneurs in both the recruitment and retention of top talent in industry-leading businesses, and the creation of a high-end design brand. Their combined geographies have spanned Egypt, France, Germany, Switzerland and Thailand, as well as New York City and Seattle. They are applying their business savvy, creativity and passion for clean water for everybody to Everybody Water. 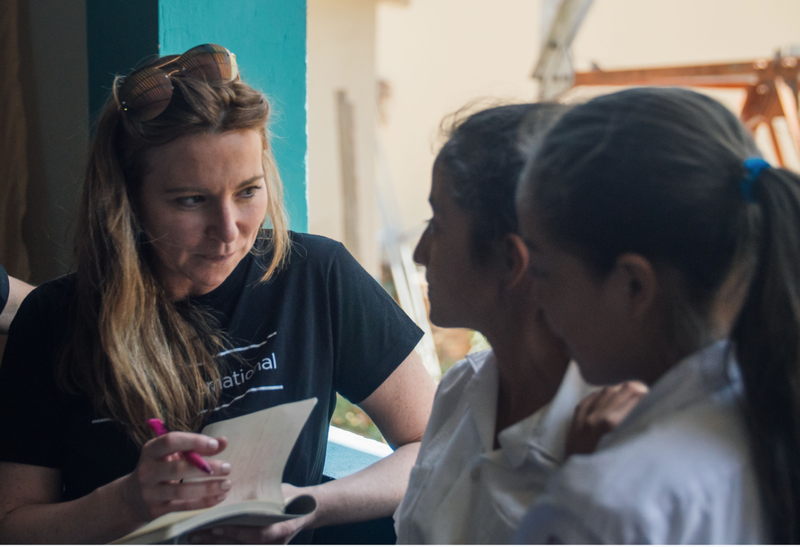 Megan and Kimberly look forward to funding upcoming projects with partner Water1st International that will bring clean water to communities in Honduras, Bangladesh, Ethiopia and Mozambique, changing lives forever. The United Nations recognizes universal access to clean water a basic human right, and an essential step towards improving living standards worldwide. Lack of convenient access to clean water reduces education and economic opportunities. We are neighbors and friends who had our own successful businesses completely unrelated to water. Over the course of a few years, countless walks, and time together on the sidelines of our childrens’ soccer games, we often discussed what was next in our careers. We both knew that we wanted to bring more meaning to our work, to do something bigger than us and to set an example for our children of making a positive difference in the world. We wanted to affect positive change in a big way and were capable and determined, and fortunate enough to have found inspired, hardworking partners in each other, living just across the street! Giving people in developing countries access to clean water became our passion, knowing that with clean water we could help people have their most basic need met, and give them a springboard to accomplish so many other things. Every day, 200 million women and girls carry every drop of water their families use and 100 million children, mostly girls, receive no education because they are carrying water. Women and girls are traditionally responsible for water collection, walking miles to the nearest sources, according to Water1st International. Health, education, as well as literacy for girls and the ability for women to earn incomes are enabled when people have access to clean, running water. Water is the first building block for communities to thrive. Water is our most fundamental need, but one in five (20 percent) of people on the planet don’t have clean water in their homes. Five thousand people die every day from water borne illnesses. Our challenge was determining how to tackle something so big in a way that makes a real dent. The answer became obvious and simple. First, engage and educate consumers about the powerful impact they can make in the world with water at the very moment they purchase water. Second, transform buying water from just another transaction into a positive impact experience that makes real change for real people. By purchasing Everybody Water, consumers are part of a community of people actively participating in the solution to build clean water systems that change lives, while reducing plastic bottles with a 100 percent recyclable carton alternative. Clearly, he didn’t understand the opportunity. Although technically, we are selling great water next to giants like Coca-Cola, Pepsi and others, we are mobilizing change and building a community ready to make amazing things happen by addressing the global water crisis. We are all human and deserve equal dignity. Who doesn’t want that? Fortunately, the next call was with our nonprofit partner, Water1st International, reminding us of our motivation and inspiring us in its example of how individuals are capable of enormous change in the world. Everybody Water is unifying a global community in an everyday choice of buying drinking water to help permanently end one of the world’s biggest problems, convenient access to clean water and sanitation. By engaging individuals in a meaningful way, purchase Everybody Water to collectively make a huge difference with something they do anyway. Everybody Water gives everybody the opportunity to say, “I won’t accept a world in which every person does not have what I have, my most basic need of clean water,” and act upon it. Every purchase will help change the world, especially for women and girls, by helping Everybody Water fund life-changing clean, running water and sanitation projects, all the while reducing plastic bottles with a carton alternative. Everybody Water can be purchased in select grocery stores and takeout restaurants and through online subscription on our website, https://everybodywater.com. The community projects we support have an enormous impact on the lives of people in the community, especially on the lives of women and girls. Believe it or not, lack of access to clean, convenient water and sanitation is not only deathly, but also it is one of the leading causes of gender inequality and illiteracy of girls in the world. When you can help people get clean water systems, you are helping them in many ways. You are giving them a future and the ability to dream big. The collective power of the Everybody Water community will have a powerful opportunity to permanently change the course of lives for future generations. The projects we fund will allow girls to go to school and learn to read and women to earn incomes, instead of spending several hours each day carrying water. As a result, communities can thrive. Access to clean, convenient water and sanitation brings people dignity and freedom. Lack of access to clean water is a pervasive, huge problem, but there are solutions, and that’s exciting! Together, we can realize amazing change. We hope to raise awareness of the global water crisis and the solutions to the crisis that exist. In the process, we want people to know that not all water projects are sustainable or equal in quality. This is why Everybody Water is selective in partnering with Water1st International, which provides completely sustainable, high-quality and permanent solutions with an unprecedented success rate. We have spent a lot of time researching nonprofits and traveled extensively to see previous projects. It became clear that some water “solutions” were merely band-aids and not permanent. Many water projects by other water organizations fail after only 2–3 years and/or offer only partial solutions like water pumps in villages that still leave people struggling. Water1st International stands out because it supports local partners to empower people to help themselves. Communities are entirely invested in the projects so that they may be able to maintain them on their own for future generations. The projects are complete, high-quality solutions, structured to bring water, showers and toilets directly into homes so that people may focus on living productive, healthy and happy lives. It’s important to be well-informed in what you choose to support. Real solutions equal real change. Well, we knew we were on to a good idea in supporting clean water projects, but there was no way we were going to add to the world’s plastic bottles. We researched all packaging options to identify the most environmentally-friendly option. We chose the carton and we chose Tetra Pak because of their high standards in pushing forward an increase in the renewability of the materials they use, as well as their efforts in increasing recycling. Once we knew we could feel good about the packaging, it was a go. The carton is 100 percent recyclable. It uses paper sourced from forests that are responsibly managed by the Forest Stewardship Council, where trees are replanted and grow back. The bio-based cap is derived from sugarcane, also a renewable resource. We are contacted every week by high school and college students who ask, “How can I help spread the word?” Everybody Water is setting up an ambassador program to harness this amazing swell of support and we welcome students to contact us at info@everybodywater.com if they are interested. Meanwhile, we are grateful for the incredibly creative photography of our cartons that people post and share on social media with our hashtags #waterwithaheart and #compassioninacarton. What are your “5 Things I Wish Someone Told Me Before I Started” and why (Please share a story or example for each.) ? Selling water is highly regulated. We were surprised when we discovered that water is highly regulated and many beverages that contain mostly water but are not 100 percent water do not require the same tests and permits. It took a lot of time to work through a web of federal and state regulations. Giving back to a nonprofit is highly regulated. We were surprised to discover the permits required and the cost associated with giving back. It is good news for consumer protection but it is quite a legal process with heavy fees required to make it happen. You can fit 60 cases of Everybody Water in the back of the Subaru but you can’t see out the back window! We experienced this first-hand and on our first deliveries of Everybody Water to local restaurants and stores when Kimberly and Megan were the delivery team! It would take almost 2 ½ years to bring Everybody Water to fruition. While we wouldn’t have wanted to know just how long it would take, we did know that we had to do things right and well, It was worth it. Now that we are selling, we are stronger for it. We would meet so many inspiring people on this journey. Along the way, we have met incredible people, from those involved in the water projects to passionate high school and college students who believe in Everybody Water, to friends and business owners who have helped spread the word. If we knew we would have been so fortunate to be around so many inspired people, we would have started on this meaningful path sooner! If you choose a career path that in some way helps others, you’ll always be able to look back with the satisfaction and fulfillment that you’ve done something worthwhile. It resonates with others too and may inspire them to help others. They will see your career choice as a major accomplishment. We believe people want to be part of our community and we will put future investments into growing that community and in-turn scaling its global impact. Our mission to bring real change through access to clean, running water is resonating strongly with consumers and other brands who want to be identified with the Everybody Water mission. Instincts are very powerful and harnessing them gives you strength. We always know in our guts what feels right or wrong and learning to respect those feelings has helped us to make good decisions. In more recent years we have both evolved to believe it is essential to have careers that make an impact and improve the lives of others in the world. We believe all people deserve to have their most basic and fundamental need for convenient access to clean, running water met. Knowing that helping people meet this need so that they may achieve so much more — health, education, literacy for girls, and the ability for women to earn incomes, is the driving force of Everybody Water. Having a burning desire to make something happen will bring you success. Author Napoleon Hill was the first one to coin that term but, wow, was he right! When you put all of your energy, power and effort into something, then everything you think, see and do is connected and will work towards making a desire reality. What inspires a burning desire? The ultimate motivation is inspired by something bigger than ourselves. It is inspired by knowing that after we are gone, the work we have done will help to make the world a better, more equitable and civilized place. Some very well-known VCs read this column. If you had 60 seconds to make a pitch to a VC, what would you say? Everybody Water is water but it’s actually a movement with the product as its vehicle. It’s a movement of people who recognize change is possible and want to be part of it. The momentum is strong and palpable. Are you someone who also wants to be part of this? Can you help us go further, faster to maximize impact? Follow us on Instagram @everybodywater and Facebook @everybodywater using the #waterwithaheart hashtag. Watch videos of the impact and meet the people from the communities we support. Help us spread the word. Megan Hayes is a co-founder of Everybody Water, where she applies her deep background in growing industry-leading companies with top talent, to overseeing business development, strategy and operations. Prior to Everybody Water, Megan spent 20 years as a recruiting consultant and manager for technology and marketing giants, such as Microsoft and Digitas in Seattle, Germany and New York City. Megan has a wide portfolio of locations under her belt, having lived in Switzerland, France, Thailand, Egypt and Seattle. She earned a Bachelor of Arts in English and Political Science and studied French and economics at The American University of Paris. Between travel and time with her husband, daughters and Bernese Mountain dog Lexi, Megan is a mentor with empowerHER, a nonprofit that provides support for girls who have lost their mothers at an early age. Kimberly Reilly is a co-founder of Everybody Water, where she applies her distinguished background in design and eye for detail to overseeing all aspects of the Everybody Water brand, from product conception to marketing and sales messaging. Prior to Everybody Water, Kimberly spent 10 years as the founder and creative director of Louis Di Calla LLC, a custom lighting design brand. There, she applied her expertise in the appraisal of high-end European design objects to create a line of custom pieces for leading architects and designers sold through leading design showrooms in New York, Boston, Los Angeles, Chicago and San Francisco. Kimberly has a Master of Arts in the History of European Decorative Arts from the Smithsonian National Design Museum program with Parsons School of Design. She earned a Bachelor of Arts from Georgetown University, with studies at la Sorbonne in Paris. When Kimberly isn’t traveling to developing countries or educating herself on clean water system implementation, she enjoys spending time with her husband and two daughters skiing in Vermont and watching them perform their favorite activities like lacrosse, soccer, hip-hop and guitar.